This week is universal letter writing week. 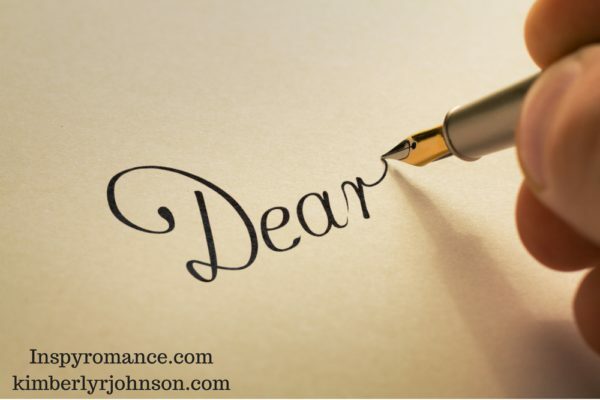 It got me to thinking about the romance of a hand written letter. Although her letters were not romantic, I immediately remembered Grams from A Love to Treasure. She wrote her granddaughter a series of letters that would guide her on a treasure hunt. Here is an example of one of them. I hope you figured out by now the game has begun. You are well on your way to discovering one of life’s great gifts. Enjoy being pampered at the spa. I’ve arranged for you to receive a facial, manicure, and pedicure. Be watching for the next clue. It may arrive when or where you least expect it. I will give you one clue in case you get out of order. I remember as a child when my own grandmother would send me letters. I can not tell you how excited I used to get used I saw a letter from my grandma. It was a big deal. I remember sitting down with my Micky Mouse stationary and writing her back. I also remember when my husband, then boyfriend, would write me love letters. I think I still have some of them in my hope chest. No text message, email, or direct message could ever compare to a hand written letter. This year I resolve to write my boys each a handwritten letter and mail it to them. What do you think about hand written letters? Do you still write them? Do you ever receive one? Side note: I am currently adding to my influencer group. I ask the following of my influencers. If this sounds like something you’d enjoy doing please contact me via my website www.kimberlyrjohnson.com. There is a contact form on the homepage. Thanks! Post reviews from the PDF version of my books–I provide PDF. As long as I’m able to hold a pen, I will always write letters, Kimberly. It makes me sad that emails and text messages are now the new normal. Neither one can be saved in your special keepsake box, unless of course it’s printed, but to me, that’s just not the same. I still have a flip phone, so I’ve never even sent a text message….LOL! Good for you, Jill. In my experience you are rare when it come to hand writing letters. There is something so special about receiving a letter. Both of my girls, 10 and 4, love when they get something in the mail. Its so much more personal than electronic things are. To me, it also shows thought and caring because it usually takes more time too. I agree, Joelle. A hand written letter means so much more. I enjoyed ‘A Love to Treasure’- what an awesome Grandma, and to ‘see’ Nicole follow the clues to discover her real treasure was fun. Wemble, I hadn’t thought about Jane Austen, but I’m a big fan. :) I’m glad you enjoyed A Love to Treasure. Thanks for your blog and best wishes on your influencer group. Even though retired and I enjoy encouraging authors and am inspired by reading their delightful stories, life with family and grandchildren is keeping me super busy this year. My oldest son has several 10 day trips overseas. My middle son just had their first child Wednesday. This retired teacher and grandma is delighted that they trust me to help care for their children. I am blessed. Since most of my relatives lived in Germany, we were a family of letter writers. At Thanksgiving my great aunt made me write all her Christmas letters. This made me proficient in German. Also gave me some spending money in high school and college. While it was a highlight to receive a letter in the mail, it is not the same as FaceTime or Skype or instant messaging. In those days it took almost a month to receive return mail. Some of my parents friends do not email, but since they are older I type their letters in larger font and keep them in a correspondence folder. One disadvantage of a hand written letter is one has no record of the news shared. Thanks for a thought provoking blog and happy writing. Renate, I’ve both seen and heard evidence of how busy retirees are. Many seem busier in retirement that they were before they retired. Congratulations on your new grandchild! I suppose if you want to keep a record of what you share with someone in a handwritten letter you could make a copy of it and save it. I use email and PMs a lot more now with friends and family (especially as most of mine live far away! ), but hubby and I still do a lot of cards and handwritten notes, too. I have a keepsake box with them all saved, especially the ones from our dating and newly married days! I think it’s special that you and your hubby give each other handwritten notes and cards. You’ve inspired me to add that into the book I’m currently writing. Thanks! Love this post! When I took the trip out west with my sister, mom, and stepdad, along the way I would mail cards back to my husband, daughter, and son. It was so much fun! There is nothing better than getting a letter or card in the mail. I still have the postcards my great-aunt sent to me when I was in elementary school in Virginia and she was in Maine. We had lived in PA until I was in third grade. I miss her. She’s the aunt who did all the genealogy for my dad’s mom’s side of the family, all the way back to the ancestors who came over with William Penn, back to a baron. I’m working on tracing my dad’s dad’s side of the family. They came from Germany. I am back to the 1600s. It is so much fun! Dad’s great-grandfather came from Germany when he was 14. I have a boxful of dad’s letters to me and a couple of books with my great-grandmother’s signature in them. I treasure those books! Wow, that is so cool, Sally! Thanks for the excellent reminder of the importance of letters! I’ll have to make a point to do that for my kids and grand kids. Postcards are such fun to receive. :) I’m super happy you have enjoyed my books. Sadly, I have let letter writing fall by the wayside. I remember writing to a pen pal when I was young. I also exchanged letters with my mother and grandmother and friends. Now email seems to be the way to communicate because it’s instant. I do still send cards. Now that you mention it, I had a pen pal too. I’d forgotten. I don’t do as much letter writing as I used to but I do send out Thank You cards all the time. We also tried to instill this in our children. I didn’t used to send them, but one time we didn’t do it at Christmas and my mother-in-law wasn’t very happy. Since then we REALLY make it a point. I think it’s that older generation which really hasn’t gotten into the whole email stuff. I have recently also seen a Facebook post about having family and friends write a letter to a soon to be born baby as a way to bless the little one when they grow up. It goes in a time capsule and then is opened later. I think that’s a fun idea. We write letters to the girl we support in Africa, it’s always fun to read her letters. We’ve also written to students who we had in our home as exchange students, we’ve had fun keeping up with them. But those are coming less and less because of technology and lives being busy. Thanks for the post and reminder of the wonder of a letter. Marylin, I love the time capsule idea. It’s funny regarding tank you notes. I send them and had my kids send to everyone except family. Wish I could still handwrite letters and journal entries, but I’ve developed arthritis in my hands from writing and editing my whole adult life. Thank goodness email was invented! I still have a handwritten letter from my grandmother that I’ve treasured all these years. Arthritis is such a pain. I have it too and it can make writing a challenge when it’s acting up. I wish I had saved my letters from my grandma. What a wonderful treasure you have. Hi Kimberly, I’m sure your boys will love receiving a letter from you. :) I also think people will eventually return to letter writing for privacy reasons. Good point about privacy! I had not thought of that. I don’t write letters like I used to, but I send cards regularly. Sometimes it is just a “thinking of you” note and sometimes it is chatty. I hope that I’m putting a smile on someone’s face. Who doesn’t enjoy getting mail that isn’t a bill – right? One of the posts above reminded me that I also had a pen pal who lived in Thailand. I may not remember much, but I do remember thinking she had beautiful hand writing.